Kansas is thrashing in Governor Brownback’s grip. Tax reform to restore desperately needed financial stability? Vetoed. Medicaid expansion? Vetoed. A fair and adequate school finance formula? That bill has not yet arrived at the governor’s desk, but the prospect of a signature doesn’t look good. The governor’s vetoes strike right at the heart of practical, fair-minded, fiscally conservative, give-a-hand-to-your-neighbors Kansas. Deep down, Kansans know the state must bring in enough revenue to pay for necessary services. It’s basic fiscal responsibility. But, as recent polling shows, Kansans have figured out it’s not happening in the state budget, and a large majority want that changed. Education, highways, and Kansas’ future depend on sound finances. The vetoed tax reform bill that would have ended the Brownback “experiment” was passed with strong bipartisan support (40 Republicans and 36 Democrats in the House, 14 Republicans and 8 Democrats in the Senate). Medicaid expansion offers health coverage to tens of thousands of uninsured Kansans, and is firmly pro-business by helping hospitals stay in operation. Kansans want to help their neighbors in this way. 82 percent favor expansion! Just like the tax reform bill, large bipartisan majorities in the House (41 Republicans, 40 Democrats) and Senate (16 Republicans and 9 Democrats) sent the Medicaid expansion bill to the governor. The state is under court order to fix school finance by June 30. Schools stand as the backbone of many Kansas communities. Again, polling shows a large majority of Kansans in support of public education, and very wary of putting schools at risk with inadequate resources. 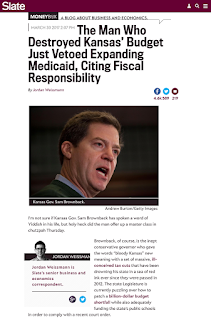 Brownback held Kansas back with his vetoes, but not singlehandedly. Legislators tried to achieve a two-thirds majority to override, but each time missed by just a few votes. The difference between override success and failure? Legislative leaders. President Wagle, Majority Leader Denning, and Speaker Ryckman voted with Brownback, and they are still trying to negotiate with him on these issues despite the fact that super majorities in their respective legislative chambers, and most Kansans, are not with them. Negotiating with Brownback on tax reform can only lead to a very weak outcome, one that still leaves Kansas broke, borrowing, postponing bill payment, and diverting highway dollars. The governor’s only answer on Medicaid expansion appears to be “no.” On school finance, lawmakers are heading toward an updated version of the school finance formula that Brownback scuttled in favor of unconstitutional and inadequate block grants. When legislators return from break on May 1, Kansas needs meaningful action. Legislative leaders have to quit Brownback, and move the state forward. Bypassing the governor may be hard for them, and out of the norm for Kansas politics, but that’s what the situation requires, and it’s what Kansans want. Please, leaders and legislators, don’t make Kansas wallow in financial stress for another year. Don’t cut out the Kansans who need health care. Don’t risk having schools closed in August. Unclasp us from Brownback’s grip. He’s not the one who will be standing for re-election. He’s not the future. Override. Free Kansas.